(Central Islip, N.Y., April 9, 2018) – The Long Island Ducks today announced the signings of right-handed pitchers Matt Larkins and Jake Dunning. 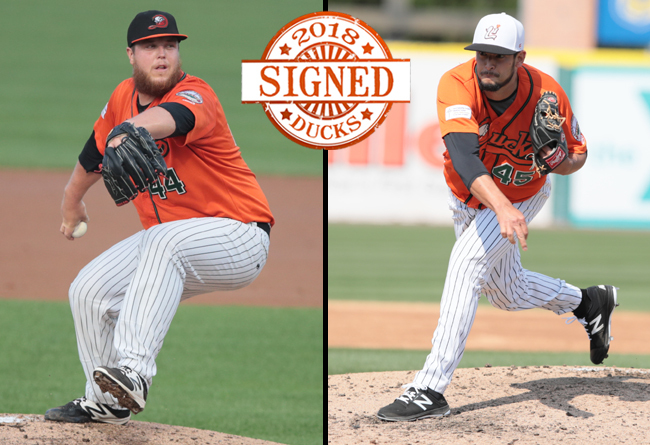 Larkins will begin his third season with the Ducks and seventh in professional baseball, while Dunning will enter his second year with the Flock and 10th in pro ball. Larkins ranked among the Atlantic League leaders in several categories during the 2017 season. He led the league with three shutouts, a Ducks single-season record, while ranking second in strikeouts (139), third in complete games (4), fourth in earned run average (3.69) and games started (26), and fifth in innings pitched (156.0). The California native posted a 9-7 record over 27 appearances and flirted with history twice, coming within three outs of a no-hitter on June 15 at Somerset and tossing a complete game, one-hit shutout on July 5 against Lancaster. He went on to make a pair of starts in the postseason, earning a crucial win in Game Two of the Liberty Division Championship Series against the Patriots. The 29-year-old first joined the Ducks late in the 2016 season, starting a pair of regular season games and going 1-0 with a 3.21 ERA. He went on to start two playoff games as well, tossing five and two-third innings of one-run ball in Game Two of the Atlantic League Championship Series at Sugar Land. Prior to his time with Long Island, the University of California, Riverside alum spent parts of four seasons in the American Association and one in the North American League. He was selected to play in the 2014 American Association All-Star Game with the Amarillo Sox. Dunning returns to Long Island after making 14 appearances (seven starts) in 2017. He compiled a 2-3 record with a 3.65 ERA and 43 strikeouts to just 14 walks over 49 and one-third innings. In his first seven appearances, all of which came out of the bullpen, he surrendered just two runs over 10 and two-thirds innings while striking out eight. The 29-year-old went on to start Game Four of the Liberty Division Championship Series, limiting Somerset to just one unearned run in five and two-thirds innings, as the Ducks clinched their second consecutive division title. The Georgia native has two seasons of Major League experience with the San Francisco Giants. He made 30 appearances between 2013 and 2014, accruing a 2.77 ERA and 16 strikeouts over 26 innings. The Indiana University-Bloomington alum allowed a run in just one of his first 13 MLB games, yielding two runs total over 13 and one-third inning during that span. He spent the first eight seasons of his career in the Giants system before joining the Chicago White Sox organization to begin 2017. Dunning was originally drafted by the Giants in the 33rd round of the 2009 amateur draft. About the Atlantic League of Professional Baseball (ALPB) The Atlantic League has been a leader in professional baseball and a gateway to Major League Baseball since 1998. Over 38 million fans have attended Atlantic League games and more than 900 players and 50 managers and coaches have joined MLB organizations directly from the ALPB. The Atlantic League emphasizes winning baseball games, showcasing the talent of top-caliber players and offering affordable family entertainment. For more information, please visit www.atlanticleague.com.